Looking for something empowering, touching, and just plain awesome to get your week started on a good note? 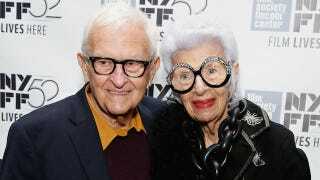 Look no further than the trailer to the upcoming documentary Iris, which chronicles the life of 93-year old fashion icon Iris Apfel and opens in New York theaters on April 29. If the name doesn’t ring a bell just yet, Apfel’s sense of style definitely will: known for her vibrant, textile-infused wardrobe and elaborate collection of couture costume jewelry—and those glasses—Iris presents itself as a glimpse into the history of a woman who ignored the rules and wrote her own story along the way.